The legal fight over the validity of the Office of Environmental Health Hazard Assessment (OEHHA) “safe harbor” for lead may finally be over for now. After more than three years of litigation, the California Court of Appeal for the First District affirmed a lower court’s decision and rejected an environmental group’s attempt to have OEHHA retract the current safe harbor level for lead under Proposition 65. The appellate decision is a major win for the California Chamber of Commerce and the business community, which has operated under the current lead safe harbor for more than 25 years. Had the current lead safe harbor been invalidated, it could have left no safe harbor lead level or forced the OEHHA to establish a new and potentially lower safe harbor lead level with adverse economic, legal and policy implications. The legal challenge centered around the regulatory “safe harbor” for lead of 0.5 micrograms per day; a warning is not required if the safe harbor is met. Appellant Mateel Environmental Justice Foundation (Mateel) sued OEHHA in 2015, seeking to compel the agency to invalidate the regulatory safe harbor level for lead that was established more than two decades ago. The relief sought by Mateel would have, in effect, eliminated the OEHHA lead safe harbor number, thereby requiring a Proposition 65 warning for all products containing any amount of lead, or alternatively forcing companies to spend hundreds of thousands of dollars providing a lead safe harbor number for their product. Recognizing the impact such decision would have on California businesses, the CalChamber and the California Farm Bureau Federation intervened in the case as a defendant alongside OEHHA, arguing in support of the safe harbor. 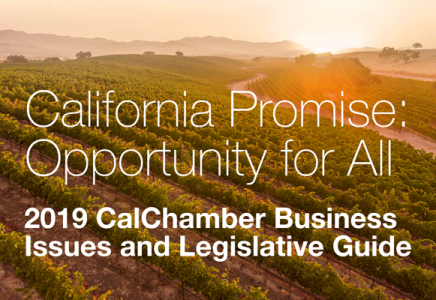 CalChamber and the Farm Bureau argued that the lead “safe harbor” provides certainty as a presumptively valid warning threshold, and without the safe harbor, businesses will be “vulnerable to Proposition 65 enforcers” in pursuit of injunctive relief and civil penalties provided by the statute. Mateel lost in superior court and appealed the decision, hoping for a different outcome in the appellate court. The First District Court of Appeal, however, again rejected Mateel’s challenge and held that OEHHA’s predecessor agency, which adopted the lead safe harbor level 25 years ago, should be afforded deference on this issue, thereby retaining the safe harbor. Invalidating the “safe harbor” for lead would have resulted in tremendous uncertainty for businesses operating in California and would have led to a proliferation of unnecessary warnings by businesses seeking to avoid lawsuits. From a policy standpoint, the relief sought by Mateel would have gone directly contrary to the Governor’s calls to reduce Proposition 65 litigation and OEHHA’s calls to reduce the amount of warnings in California’s stream of commerce. From a business standpoint, such outcome would have been extremely costly for companies already trying to comply with Proposition 65. Businesses would have been forced to over-warn on their products regardless of whether there were any scientific dangers, or risk even more Proposition 65 “shakedown” lawsuits. Proposition 65 is a fixture of California’s consumer products legal environment. California voters originally approved the Proposition 65 ballot initiative in 1986 as a way to ensure that the state’s drinking water sources are not contaminated with chemicals known to the state to cause cancer, birth defects or other reproductive harm. The initiative also aimed to let consumers know via a warning label when a certain product would expose them to such chemicals. Over the years, Proposition 65 has led to the growth of a multibillion-dollar cottage industry of “citizen enforcers” who often enrich themselves by using the statute’s warning label requirements as an excuse to file lawsuits. Businesses have relied upon the current lead safe harbor level for more than 25 years. The Court of Appeal decision is a major victory for companies doing business in California and looking for regulatory consistency when complying with Proposition 65.